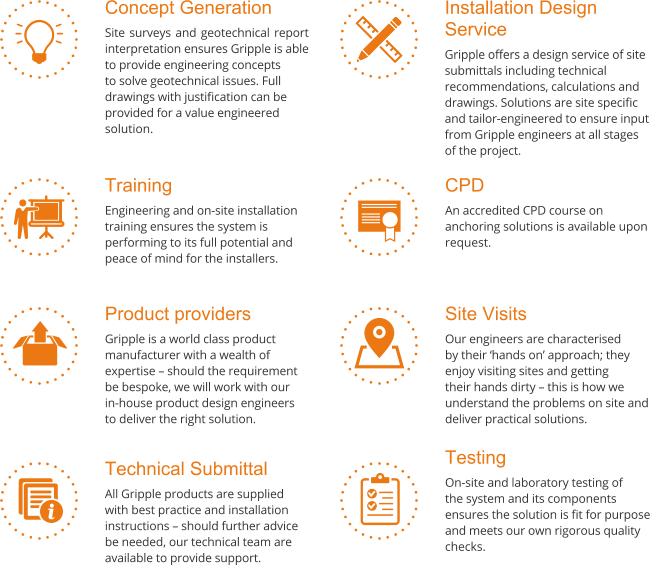 Gripple is a market leading manufacturer delivering time-saving simplicity and problem-solving innovation in Building Services, Seismic and Force Protection, Agriculture and Civil Construction. With partners around the world, Gripple is a globally recognised brand, synonymous with time, labour and CO2 saving solutions, outstanding technical support and innovation driven by employee ownership. 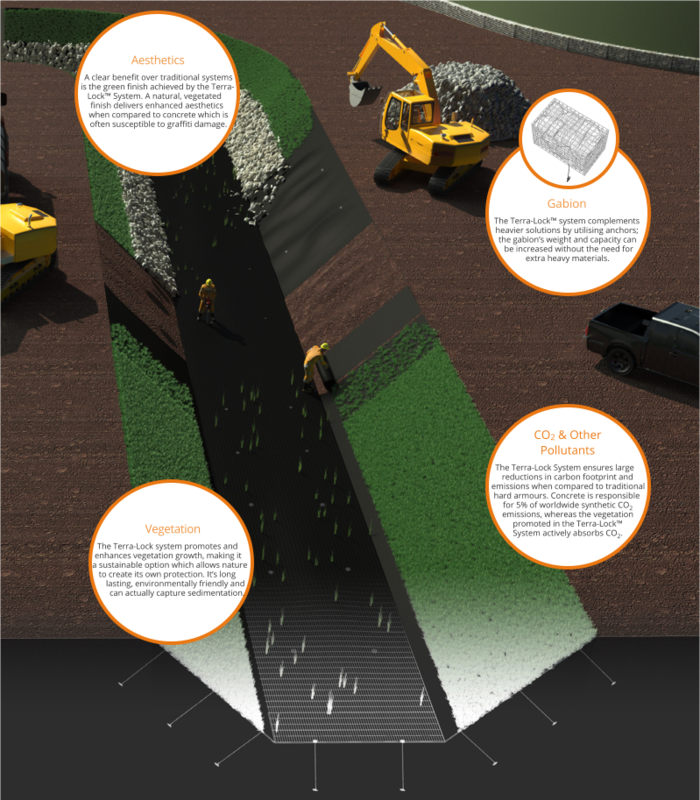 Gripple offers a comprehensive solution for slope stability and erosion control, characterised by high quality products, designed and manufactured in-house, alongside on-site training and support delivered by a team of dedicated technical experts. Creating sustainable and durable green structures by reinforcing nature, the Terra-Lock™ System is the innovative, next generation solution, designed to replace or work in conjunction with traditional methods of soil retention and slope stabilisation. 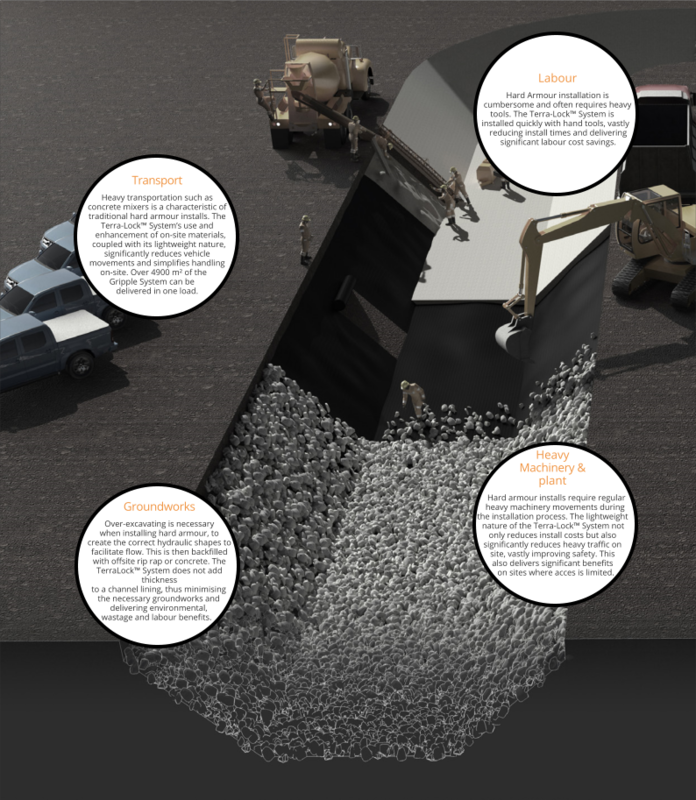 The Terra-Lock™ System gains its stability by coupling key engineering principles with specifically designed products to successfully utilise the natural properties of on-site materials. Gripple’s innovative ‘grip’ and ‘pull’ technology is complemented by anchor systems and TRM (Turf Reinforcement Matting) to deliver a comprehensive, trusted solution. Gripple’s hydraulic design service ensures the correct TRM can be installed. The TRM reduces surface erosion from water and air, while its permeability prevents undermining of the structure. 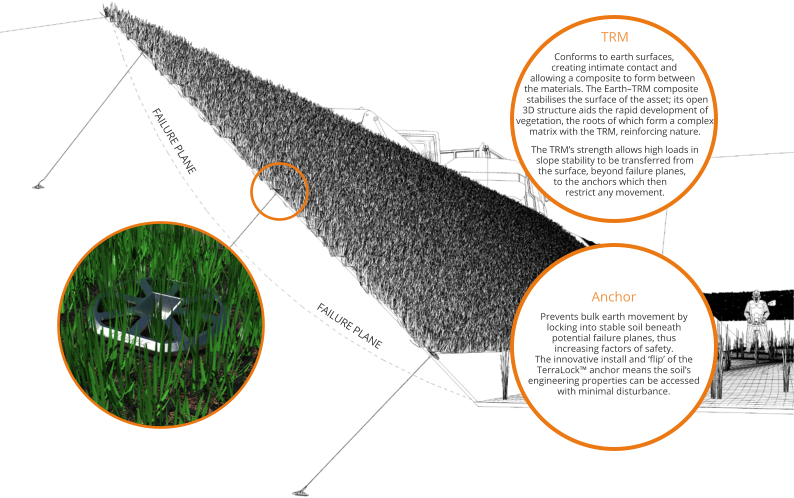 The Earth–Vegetation–TRM composite allows for a large increase in the allowable shear stresses from erosion which prevents excessive soil loss. The anchors then transfer shear forces deep into the ground to ensure a secure and stable system. Use JackJaw® to remove Drive Tool and load lock system. Tip: For a neat and professional finish, use Gripple Wire Cutters to cut wire below grade if required. Gripple’s Terra-Lock™ System ensures considerable time, labour and consequently, cost savings, while delivering ‘greener’ structures. The solution offers many construction, engineering and environmental benefits when used near water or on slopes alone. The system reduces failure and importantly, flood risk by maintaining the engineered size and shape of water assets so they continue to function correctly. 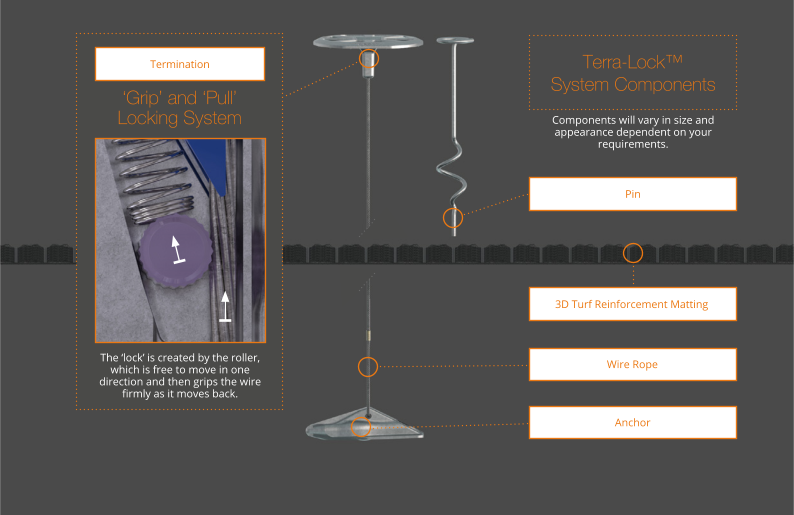 Reinforcing elements of the solution alongside the promotion of vegetation means the Terra-Lock™ System is essentially ‘self-healing’, delivery longevity to the install. Manufactured using corrosion resistant materials to ensure longevity. Allows slopes and embankments to be sharply angled, reducing groundworks and maximising use of space. Easy to handle on site and adds minimal excess loads to the structure. Minimises settlement and subsidence, especially in poor soils. The system actively holds the surface, locking it deep into the structure while catching and retaining surface failures. 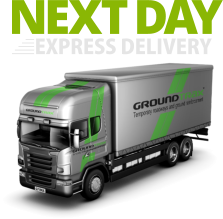 For more information visit www.groundtrax.com. For any technical services, including site visits, please call us on: +44 (0) 3456 800008.